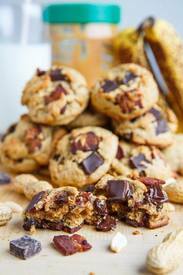 Pb banana bacon & chocolate chunk cookies! Peanut butter cookies are classic for good reason and they are one of my favorite cookies! It's hard to beat a melt in your mouth soft and chewy peanut butter cookie! One of the great things about the basic peanut butter cookie is that you can easily change things up! Like the peanut butter and banana flavor combo? Why not add some banana to your peanut butter cookies? Love peanut and chocolate together? Add some chocolate! Enamoured with the peanut butter, banana and Bacon sandwich, aka The Elvis? Why not a cookie version? This is it, the ultimate peanut butter cookie with bananas, chocolate, honey roasted peanuts and Bacon!! These soft and chewy banana peanut butter cookies with chocolate chunks and Bacon are just as easy to make as the original and so much better! I mean, Bacon in cookies? Peanut butter cookies even? Yum!